This is something rather different than my other "products". It's a set of props designed for use in creating IVAs and is really of no use for your average user. That's why it's in Addon Development. Unlike say, ASET props, this set is more designed to extend stock props and be used for decorations rather than interactive functionality. I hope it will be helpful in increasing people's IVA work velocity and removing some pain. Currently most of the props are station-focused, but there are enough bits that they can be used in many other situations. Food: Really should be called "Coffee"
Static Screens: Flat screen planes with a number of designs, like engineering readouts and orbital displays. And SimFarm. 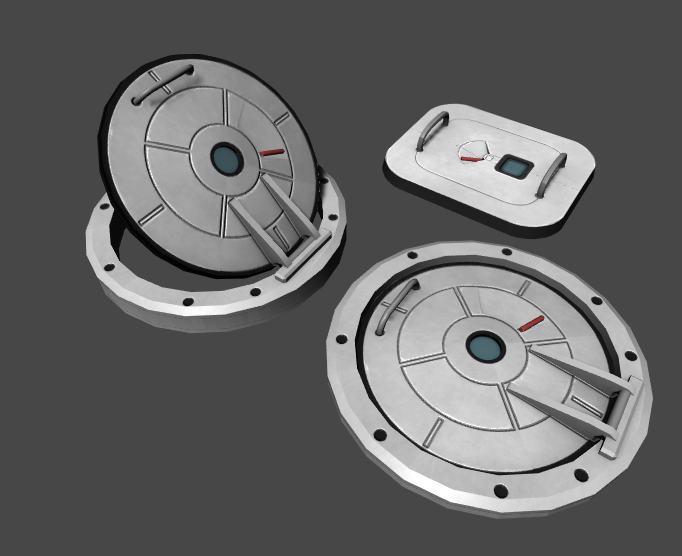 RPM Assets: Some props have RPM versions, specifically the MFD screens. This support will only be enabled with RPM installed though. The full current list is here. You can check out the following screenshot gallery for a general glimpse at the props, though it is by no means complete. Q: Do you have RPM support? A: Some props have support. Not all of them. @Nertea, those are really impressive. I'm no modder, so I won't be using these obviously; but besides helping other modders speed things along, this really demonstrates how much design and artwork is required to build an IVA. My hat's off to ya. Thank you for this @Nertea I would have gladly used this for the Rack and components alone but the coffee and not pads are too good to pass up! Its the extra detail my habs needed. MiniAVC took me to the other Near Future thread, and not this one. Leaving me confused about whether NearFutureProps meant Near Future Propulsion. Yeah it should take you there. This is for developers only, any of the packages in that thread (and elsewhere) should be fully updated. Stockalike Station Parts has not been, presumably due to your stated intent to deprecate it. I just downloaded it today, and don't see a way to update the included version .2.0 of this package to .2.1. Should I just disable MiniAVC? EDIT: Can confirm that works, as does installing the beta build of the successor mod. There's a download in the OP if you really care a lot. The improvements are irrelevant to anything currently in the releases forum though. SWEET props! I love a good EVA and I see things getting much better details as this grows! Looking forward to seeing more IVA goodies! OH yes, more props for all the things! and now a gym suite, excellent. If I may point out what confounded me in downloading this for a number of days. On the Github primary download site, under "Assets", I find Source Code. And Source Code. I have since found that the Souce Code zip does appear to hold the compiled stuff to pour into Game Data. If that was explained there someplace, I apologize, I must have missed that (happesn, as I'm visually challenged). Weird, the release zip has not been attached to that. I'll fix that. Nartea, please remove the folder encryption in release versions - I mean to uncheck flag "Encrypt Contents to secure data". Thanks. 0.3.2 has been released, to slow claps from the peanut gallery. @Nertea, after seeing your assorted update posts in your various mod threads, I gotta say your sarcasm has reached a new, arid level, of dryness. Minor update deployed: KSP 1.4.3. Also versioned winder, so will be valid until 1.4.9 and Squad fixes their crap. First Error out of the box. can we get a list of mods that used this assets? This is beautiful stuff man! I am just getting around to trying this out and hope to put something in space over the weekend. Another thanks of all your time and hard work.